As soon as I read the mail..about the trek...I was so excited ! It was the much longer break I needed amidst the studies..the stressful life! Then..I got a mail about itinerary! My joy knew no bound !Preparations went on normally. I loaded my bag with 3 -1 liter water bottles,then junk and lunch! I couldn’t sleep the entire night on 23rd! Then I closed my eyes for some time..like may be 2-3 hours..it was already 5 am ! the alarm rang! I got ready! I sat in the cab and suddenly mind started wondering about..
Usually, when I sit in cab or bus..all I think of is medical mnemonics! What would I do if I find a patient who is running at the speed of light? Ha ha.. So the meeting time was 6:45am at the majestic railway station entrance! I reached there on time! Then I met Dinesh..organizer! There were a few boys..who I dint talk to at that point of time.. 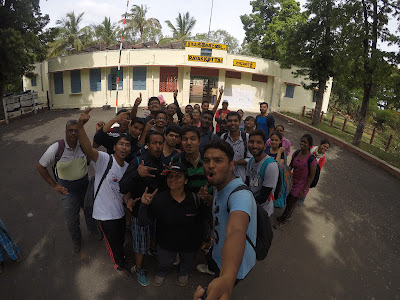 I met a lot of people from previous BTC treks..it was nice to see faces that I had already seen! Then others joined!at Byappanahalli station! Then instead of playing this traditional trip game dham sharads...we started having introduction session and started singing songs..there were many singers,cooks, dancers! This was real time! we had loads of fun..it was an enthusiastic gang! Then, we stopped at certain point and had a formal introduction session! Here is when actually something exciting happened..we clapped our hands against thighs in a fashion of WE WILL.. WE WILL.. ROCK U! I was very excited.. I have always dreamed of getting lost in the woods! Then at around 10:30.. we started …. 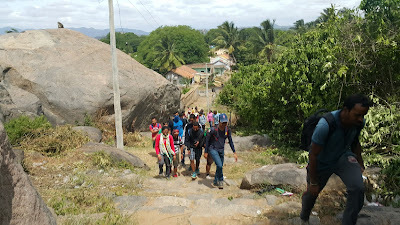 Rayakottai fort is one of the ancient fortresses in the Krishnagiri district. The fort is situated within the town of Rayakottai which is one of the ancient fortress in the Krishnagiri district! The place seemed nice..typical village environment..too hot yet breezy! Initially it was very easy..the foot of the hill was awesome…there we're bushes with beautiful flowers shining so bright in the glimpse of sun! there were a few villagers and kids who were washing their clothes close to the homes! Now after covering 2 Kms ..we took around 2-3 breaks..and did lots of photography sessions! This was an epic moment for me. This was the first time I ever went to a fort trek and it was awesome . We then decided to have lunch and start descending down by 2! So we sat down and had played ping ping game...we danced ..sang..talked! After exploring…the rest of the place we started descending down at around 2:30! This time it was fun and easy…but I kept falling a lot of times. all because of the topsy-turvy slopes! So we reached the station at around 3:30 pm. We had this feedback session! Self dissolved into supreme, no questions, no answers, its just bliss. Thanks to the organizers for making the trek so interesting and exciting!